← How to convert files of AutoCAD to xpm? How to convert files of AutoCAD to xbm? XBM is short for X11 Bitmap Graphic which is a kind of raster image file.It is used by the X Window System (X11), a graphical user interface (GUI) used to manage networked client-server computers. XBM file stores a monochrome image that is written as plain text in the C programming language. XBM images are compiled by a C compiler instead of an image program. They are used for storing icon and cursor bitmaps for X11. If you want to convert AutoCAD to xbm format file, you should find a document converter which supports the input format as AutoCAD or dwg format and the output format as xbm format. docPrint Document Converter Professional which is also called docPrint Pro is a such kind of software. docPrint Document Converter Professional is a software product that dynamically converts MS Office 97/2000/XP/2003/2007, WordPerfect, AutoCAD DWG, PostScript, Adobe Acrobat PDF and many other document types to Adobe Acrobat PDF, PostScript, EPS, XPS, PCL, JPEG, TIFF, PNG, PCX, EMF, WMF, GIF, TGA, PIC, PCD and BMP etc formats. It works in GUI version, Command Line version and virtual printer version. With docPrint Document Converter Professional you can convert your documents from and to 50+ formats easily. 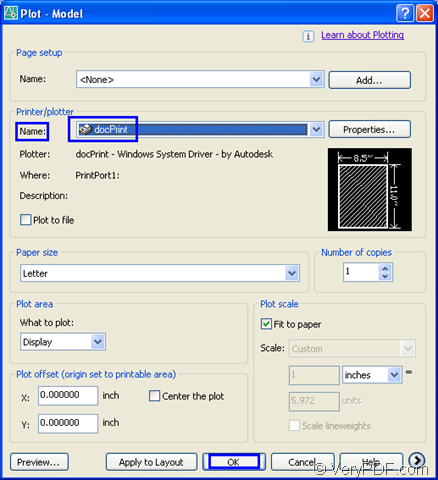 This article will introduce the virtual printer in docPrint Pro—docPrint which is a Windows printer driver that saves ink, paper and time by controlling printed output, it supports print 2, 4, 6, 8 or 16 pages on a single sheet of paper, it also supports scale A0, A1, A2, A3 papers to standard Letter or A4 paper sizes. 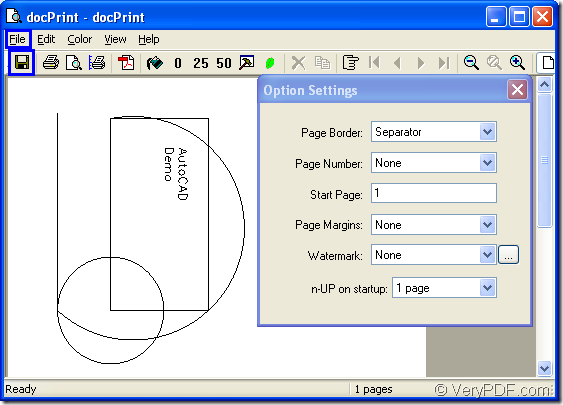 You can print a document to "docPrint" and you will be able to start using Document Printer software. Here are the steps to convert AutoCAD to xbm format file. If you are puzzled with this problem, you can get useful information her. 1. 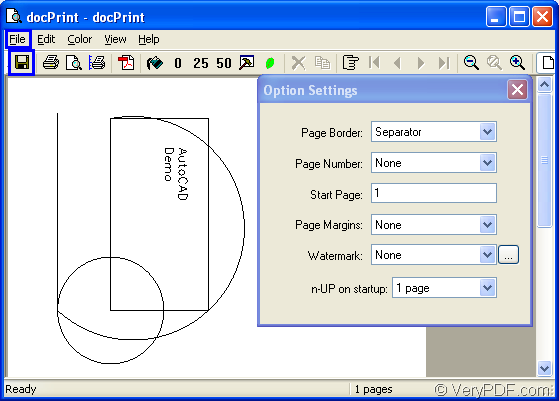 If you have set docPrint as your default printer, you can right click the dwg file in your computer and click “Print” option in dropdown list to run docPrint directly instead of opening the file. 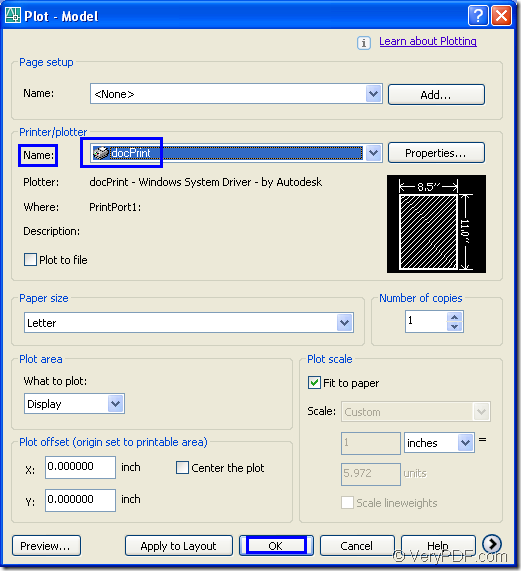 If not, you should open the document and click “File”—“Plot” to open “Plot-Model” dialog box, then choose “docPrint” as current printer in “Name” combo box framed in the rectangle in Figure1. Then click “OK” button. You can also use the hot key “Ctrl”+ “P” to open the dialog box. 2. The “docPrint” dialog box will come out in which you should follow the methods below to open “Save As” dialog box. You don’t need to care about other icons in the toolbar if you want to convert AutoCAD to xbm format file only without adding any parameters. Please see Figure2. (1) You can click “File” and click “Save as” in dropdown list. (2) You can click the icon framed by the blue rectangle in toolbar, which means save file. (3) The hot key “Ctrl”+ “S” can help you all the same. 3. In “Save As” dialog showed in Figure3, you can do the following operations to save your target file. In “Save in” combo box, you can find a suitable location for the target file. In “File name” edit box, you should input the name of the target file. In “Save as type” dialog box, you can choose the file type for the target file. By clicking on “Save” button, you can run the whole conversion. It will be a short time like a blink to finish the conversion of AutoCAD to xbm. To find your target file in specified location marks the end of this conversion. If you want to know more about docPrint or docPrint Pro, please visit http://www.verypdf.com/artprint/index.html. How to convert pdf to mhtml document?